Cassell’s dictionary of slang (Jonathon Green) says it happened sometime in the 1960s. My parents house sat at the top of a hill in New Hampshire, and every thunder storm was potent. But when a ‘thunder boomer’ passed through, and my gram started flicking holy water on the lintels, you got the distinct feeling that the storm was meaningful. My personal experiences pale in comparison with some earlier tempests in New Hampshire’s history. 1765. Captain Thomas Colburn of Hudson NH was killed by lightning 20 August 1765. His widow Mary married Major Samuel Moore after his death. 1802. Stephen Rowell, youngest son and child of David and Mary (Brown) Rowell was born in Croydon New Hampshire 27 June 1802. His mother was killed by lightning while he was an infant asleep in her arms. She was only thirty-six. Stephen lived to the age of seventy-five years. 1820. Major Joseph Bellows, b. 3 Nov 1770 in Lunenburg MA. Raised in Walpole NH, he moved to Rockingham Vermont, where in 1820 he received a very severe electric shock during a thunder storm and never fully recovered therefrom. In that storm his seven barns were entirely destroyed by lightning, together with other outbuildings, and the entire crop of hay and grain which had just been harvested. Incidentally, this same Joseph Bellows’ second wife was Mary Adams, a second cousin of President John Adams. June 26, 1828–the windows of the Meeting-house in Newmarket, broken in and the wife of Mr. Daniel Gerrish, formerly of this town injured. A house in Rye, occuped by a Mr. Varrell struck, and his wife considerably injured. A Miss Clark, of Barnstead was killed by lightning on Friday afternoon, June 4. July 16, 1831, during a severe thunder storm on Sunday, the lightning entered the house occupied by Mr. Charles Hart of Sutton, by way of the chimney, while five of his children were sitting and standing around the fire, and instantly killed one of them, Joseph, aged 6 years, and slightly injured the others. Mrs. Hart was at the time in an adjoining room, and was rendered senseless for a short time by the effects of the lightning, while the sole of the shoe upon one of her feet was partly detached. July 14, 1835. During the shower in the afternoon of Sunday last, 5th inst., the house of Solomon King, in the westerly part of Sutton, was struck by lightning and Mr. King and his wife were instantly killed. The circumstances attending this melancholy casualty, as near as we can learn are the following: –the lightning passed down the chimney of the house and entered a room in which were Mrs. King, her son and daughter and two neighbors, who had stopped for shelter from the rain. Mr. King had just left the room and gone into the entry, for the purpose, it was supposed, of shutting the outside door. The electrical fluid in its descent divided into two branches, one of which passing through the entry, struck down Mr. King in its progress. The neighbors who were in the room, seeing him falling, sprang to his assistance, but he had sunk to the floor before they reached him. The fluid went out through the door by the well into a hog pen, throwing considerable rubbing into the well, and killing a sow and four out of eight pigs in the pen. The other branch of the fluid passed into the cupboards, demolishing the contents and in its course struck Mrs. King and her son while sitting in their chairs. The latter seeing his mother’s cap on fire, endeavored to rise to go towards her, but found himself unable to move. The other persons on coming back into the room, did not at first notice her situation, but soon discovered that life had fled, although she retained her position unchanged. The son recovered from the shock in a short time. There were only slight marks of violence on the bodies of the deceased. Mr. King was sixty-three years of age, his wife a few years younger. They were both respected by their neighbors, and their disastrous fate is deeply lamented. September 1, 1838. Lightning. The tavern stable of Mr. John Farnum in Peterborough, was struck by lightning on Friday afternoon but did little damage.–A gentleman named Mears, of Boston, with his lady had just driven under the shed to avoid the shower, and had not left the carriage more than two minutes before the explosion, by which his horse was killed. July 31, 1841. The lightning struck the Swamscot House, in Exeter, on Friday fortnight, throwing down one chimney, and setting the roof on fire, which was extinguished before any damage was done. The bricks fells upon a little boy, aged five years, named Barney, fracturing his skull in a shocking manner. The wound was dressed but it was supposed that he could not live, although sensible on Saturday morning. August 1, 1871. Struck by Lightning — Amos Manser, a brakeman on the Concord Railroad, was struck by lightning last night, near Little field’s Cross, on the Portsmouth Road, while coming up on the night train. He was on the platform of the car and had just turned to enter the car after letting out the brakes, when he was struck by lightning and prostrated, falling into the door of the car. When taken to his home, his right leg was useless and he was suffering great distress from the shock, but this morning we understand that he is better and has partially recovered the use of the limb, and it is thought he may be out in a few days. June 29, 1876. The thunder showers of Tuesday afternoon were widely extended and severe. At Candia two cows and a valuable Ayrshire bull, belonging to Jeremiah Lane, were killed in a pasture by lightning. While Mr. lane, with the assistance of some of his neighbors, was endeavoring to resuscitate the animals, he fell down and instantly expired. He came from Hampton Falls to Candia about 20 years ago. He was 76 years of age, and leaves a widow and four children. June 1876. At Manchester the lightning struck four houses– one on High Street, owned by John G. Moore; one on Concord street, corner of Hall, owned by William Carr; one in Hallsville [south east Manchester] owned by Charles E. Hodgdon; and another in Amoskeag village, owned by Archie Campbell, who also lost a valuable horse killed in the stall. The thumb of Mr. Huntington, station agent at Newmarket, was taken off by a discharge of electricity, while at his telegraph key Tuesday evening. Miss Haseltine, the operator at Exeter depot, received a heavy shock, producing deafness in one ear. The report was like a rifle shot, and paper and plastering were scattered about. We’d like to think that the incidences of lightning are rare these days, however that simply is not true. In 2010 there were 29 fatalities in 19 states (Alabama and Georgia with three each, New Hampshire had none). In many years deaths from lightning strike has outpaced that from tornadoes and other disasters. Traditionally Florida has more than twice the number of lightning deaths of any other state. The rest of the top ten states, in order, are Michigan, Pennsylvania, North Carolina, New York, Ohio, Texas, Tennessee, Georgia, and Colorado.Fewest casualties are in Alaska (none), Hawaii, the District of Columbia, northwest states, Puerto Rico, and small eastern states. Today New Hampshire ranks 16th in the nation for casualties from lightning strikes. July is reputedly the deadliest month. 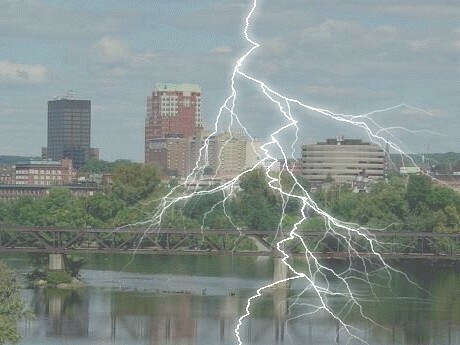 The Body Electric, story of Gail Rondeau & family, struck by lightning. NOAA: Lightning Safety Myths and Truths. This entry was posted in History, Oddities, Accidents and Crazy Weather and tagged Amos Manser, Archie Campbell, Barnstead, Bellows, boomer, Candia, Charles E. Hodgdon, Clark, Colburn, Concord Railroad, Croydon, Daniel, Exeter, Gerrish, Hampton Falls, Hart, Hudson, Jeremiah Lane, John Farnum, John G. Moore, Joseph, kill, killed, lightning, Lunenburg, MA, Manchester, Massachusetts, Mears, meetinghouse, New Hampshire, Newmarket, NH, Peterborough, Rowell, showers, Solomon King, strike, Sutton, Swamscot House, thunder, Varrell, Walpole, weather, Willilam Carr. Bookmark the permalink.